The most popular pinball machine in history with approximately 22,000 manufactured. This movie licensed pin was ahead of its time in design and is packed with with features. Its a proven title with timeless game play and fun that lures even non pinball enthusiasts to play. Game design from Pat Lawlor, the creator of such titles as Twilight Zone and Family Guy. Pat is one of the pinball geniuses of our time and has a track record for success. Take a tour of the with the creepy Addams Family and visit all of the separate rooms in their mansion. Visit them all, and you get to `Tour The Mansion', the wizard mode where you get to play them all again in sequence culminating in multi-ball. 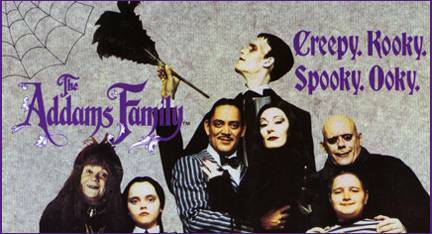 The back glass features Morticia and Gomez (Angelica Houston and Raul Julia) with the rest of the family. This pinball features beautiful artwork, fantastic music and great movie quotes by the late Raul Julia. The Addams Family has 3 regular sized flippers and a smaller "Thing Flip". An industry first, this game-controlled flipper will automatically make shots during the game. The "Thing" will "lend a hand" to pick up pinball's and lock them away for 2 or 3 multi-ball. Additional goodies on the playfield include 5 pop-bumpers, animated book case and magnets under the playfield that randomize ball movement. Lastly, the Addams Family topper in the form of a storm cloud that lights up to simulate lighting. "Now there's some `thing' special in pinball!" "A pinball experience for the whole family!"